a device for exact time measurement; its main component is the quantum frequency standard. Atoms perform the function of the “pendulum” in quantum clocks. The frequency that is emitted or absorbed by the atoms during their quantum transitions from one energy state to another controls the operation of the clock. The frequency is so stable that quantum clocks measure time more exactly than astronomic methods can. Quantum clocks are also frequently called atomic clocks. Quantum clocks are used in radio navigation systems and at astronomical observatories and research and testing laboratories, replacing the less advanced quartz clocks. The signals from quantum frequency standards themselves cannot be used to drive the clock mechanism, since their power is negligible and their oscillation frequency is usually very high and has a noninteger value (for example, the power of an atomic hydrogen generator is 10−11 to 10−12 watts, and its frequency is 1420.406 megahertz [MHz]). This makes difficult the use of quantum frequency standards in the time service, in various navigation systems, and in laboratory practice. In such cases a set or network of standard, high-stability frequencies (1 kHz, 10 kHz, 100 kHz, 1MHz, and so on), with a high output signal power, is more convenient. For this reason, in addition to a quantum frequency standard, quantum clocks also contain special electronic devices, which form such a frequency network and drive the clock’s hands (or change the digits on its face) and produce exact time signals. Most quantum clocks contain an auxiliary quartz-crystal oscillator. Because of the change in the oscillator’s frequency with time (aging), the accuracy of a quartz clock based only on such an oscillator would be insufficient. In a quantum clock, the frequency of the quartz-crystal oscillator is controlled by a quantum frequency standard, which raises the accuracy of the clock to the level of the quantum standard itself. However, the introduction of periodic corrections by the operator is not always feasible. In some devices, particularly in navigation instruments, it is more efficient to increase the frequency stability of the quartz-crystal oscillator by automatic tuning of its frequency to the frequency of the quantum standard. The amplified signal of the difference frequency (vst − nvq) is fed to one input of a phase discriminator, and the oscillations of the quartz-crystal oscillator are fed to the other input. The phase discriminator generates a potential whose magnitude and sign correspond to the difference between the difference frequency Δ and the frequency of the quartz generator vq. This potential is then fed into the unit that controls the frequency of the quartz-crystal oscillator and generates a shift of the oscillator frequency that compensates for the deviation of vq from the difference frequency Δ. Thus, any change in the frequency of the quartz-crystal oscillator causes the generation at the output of the control unit of a potential that has the corresponding magnitude and sign and shifts the frequency in the opposite direction. Therefore, a constant frequency of the quartz-crystal oscillator is automatically maintained. Consequently, its frequency stability becomes virtually equal to the frequency stability of the quantum standard. The frequency synthesizer generates a network of standard frequencies of the same accuracy from the signal of the quartz-crystal oscillator. One of these frequencies is used to run an electric clock, and the other frequencies are used for metro-logical and other purposes. The accuracy of operation of the best quantum clock of this type is better than 1 sec in several thousand years, given careful construction and tuning. The first quantum clock was built in 1957. 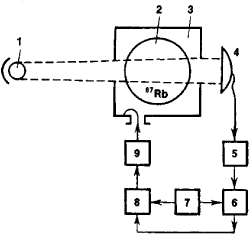 Its frequency standard was a maser based on a beam of ammonia molecules. Quantum clocks built later, which use a beam of cesium atoms as the frequency standard, do not require calibration against a standard, since the nominal value of the fundamental frequency may be determined from manipulations within the instrument itself. Disadvantages of these quantum clocks are their great weight and high sensitivity to vibration. Quantum clocks of another type—the most common—use a rubidium frequency standard with optical pumping. These clocks are lighter, more compact, and unaffected by vibration, but they require calibration, after which they maintain the established frequency value for a year, with an accuracy of the order of 10−11. The main component of a rubidium quantum clock is a special microwave spectroscope with optical pumping and optical readings that is set to the spectral line of 87Rb, in the superhigh frequency band. The spectroscope contains a cavity resonator (3), within which is a bulb (2) with vapors of the isotope 87Rb (Figure 2) at a pressure of about 10−6 mm of mercury (mm Hg). The resonator is tuned to 7835 MHz, the frequency of the spectral line of 87Rb. The sensitivity of an ordinary microwave spectroscope is insufficient for locking in on the radio-frequency line of 87Rb. To increase sensitivity, optical pumping of 87Rb vapor and optical indication of the spectral line are used. The 87Rb atoms are exposed to light whose frequency coincides with the frequency of another spectral line of 87Rb lying in the optical region. The low-pressure gas discharge tube (1) illuminates the bulb containing 87Rb vapor. Light that has passed through the tube strikes a photoelectric detector (for example, a photoelectric multiplier). Under the influence of the rubidium lamp (pumping), the 87Rb atoms become excited—that is, they undergo a transition from the state with energy ε2 into the state with energy ε3 (Figure 3). If the light intensity is sufficiently high, saturation takes place (that is, the number of atoms in the states ε2 and ε3 becomes identical). In this case, the absorption of light by the vapor decreases (since the number of unexcited particles at level ε2 capable of absorption of light quanta decreases) and the 87Rb vapor becomes more transparent than it would be without pumping. If pumping is accompanied by irradiation of the 87Rb vapor with radio waves of a frequency corresponding to the transitions of 87Rb atoms between levels ε1 and ε2, then absorption of the radio waves will lead to the transition of 87Rb atoms from level ε1 to level ε2 (Figure 3). Such a radio wave will inhibit the saturating action of the light wave, which will result in increased absorption of light by the 87Rb vapor. Thus, by using a photoelectric detector to measure the intensity of the light that has passed through the tube with 87Rb vapor, it is possible to determine exactly whether the vapor is acted upon simultaneously by light with intensity corresponding to the ε2→ ε3 transition and by a radio wave with the frequency of the ε1→ ε2 transition. The source of radio waves is a quartz-crystal oscillator, which excites an electromagnetic field of the resonance frequency in the resonator. If the frequency of the oscillator is varied smoothly, the intensity of the light incident on the photoelectric detector will decrease sharply when it coincides with the frequency of the spectral line of 87Rb. The dependence of the intensity of the light passing through the 87Rb vapor on the frequency of the radio wave is used for automatic tuning of the frequency of oscillation of the quartz-crystal oscillator depending on the frequency of the spectral line. The oscillations of the quartz-crystal oscillator are phase-modulated using an auxiliary low-frequency oscillator. Therefore, light passing through the bulb becomes intensity-modulated by the same low frequency. The more closely the frequency of the electromagnetic field coincides with the frequency of the spectral line of 87Rb, the greater the modulation of light. After amplification, the electrical signal from the photoelectric detector is fed into the phase discriminator, which is also receiving the signal from the low-frequency generator. The smaller the frequency difference (detuning) between the frequency of the spectral line and the frequency of the resonator field, the greater the amplitude of the resultant output signal of the phase discriminator. The signal is fed into an element that changes the frequency of the quartz-crystal oscillator and maintains its value at a level such that it coincides with the peak of the 87Rb spectral line. The accuracy of a rubidium quantum clock is determined mainly by the width of the spectral line of 87Rb. The main cause of broadening of the spectral line in gases and vapors at low pressures is the Doppler effect. To reduce its influence, a buffer gas (at a pressure of several mm Hg) is added to the bulb containing 87Rb vapor. As the 87Rb atoms collide with atoms of the buffer gas, they become “jammed” between them and perform rapid chaotic motions, remaining, on the average, almost in the same location and diffusing slowly through the interior of the bulb. Consequently, the spectral line assumes the shape of a narrow peak on a wide, low pedestal. The width and position of the peak depend on the composition of the buffer gas. For example, a mixture of 50 percent neon and 50 percent argon makes possible reduction of the width of the peak to about 100 Hz, in which case its position is displaced by only 0.02 Hz upon a change of 1°C in temperature or of 1 mm Hg in pressure. The accuracy of rubidium quantum clocks is also determined by the stability of intensity of the light of the pumping lamp; therefore, automatic intensity control systems are used. It is possible to construct rubidium quantum clocks in which the optical indication system described above is replaced by a rubidium-vapor quantum generator. These quantum clocks use optical pumping of such intensity and a resonator with such a high quality factor that conditions for self-excitation are satisfied. In this case, the 87Rb vapor filling the bulb in the interior of the resonator emits electromagnetic waves at a frequency of 6835 MHz. The electronic circuit of such quantum clocks also contains a quartz-crystal oscillator and a synthesizer, but in contrast to the preceding instrument, the frequency of the quartz-crystal oscillator is controlled by an automatic phase control system in which the reference frequency is the frequency of the rubidium generator. Kvantovaia elektronika, Malen’kaia entsiklopediia. Moscow, 1969. Pages 35 and 241. Grigor’iants, V. V., M. E. Zhabotinskii, and V. F. Zolin. Kvantovye standarty chastoty. Moscow, 1968. Page 171. Also in the invention pool is a quantum clock that measures time from multiple dimensions and provides a physical unification of Einstein's Theory of Relativity and Quantum Mechanics within a solid-state technological environment. A supercharged quantum clock network could do much more than tell time. Quantum clock synchronization could change operating procedures across the entire military, and using low-power quantum devices on space-based platforms would help the United States maintain space dominance via space-based quantum sensors, secure communications and on-board data processing. Other areas are quantum simulators to simulate new materials and chemical reactions and quantum clocks that will track the vibrations of a single atom to provide almost unimaginable accuracy.